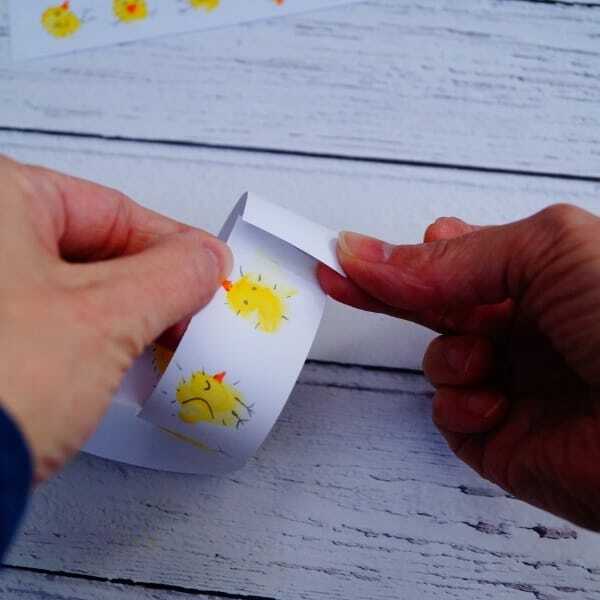 This months blog is all about having fun and entertaining the kids this Easter but beware all adults, it really is a bit addictive and you might just end up joining in or finding excuses to make it without them! 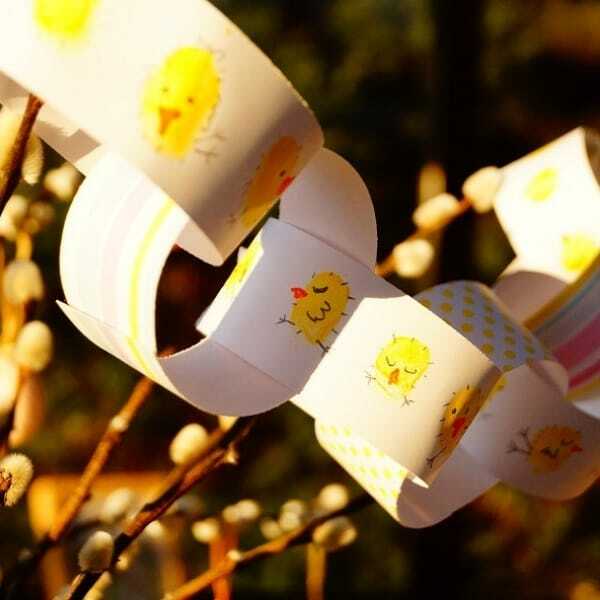 Creating your own decorations is so satisfying and one of our favourites to make with kids are paper chains. They are ultra easy to do and can be designed to work with any occasion or any season making them so very versatile. They can also be used in other ways too…When is a paper chain not a paper chain? When it’s a napkin ring!! Or a bracelet..or a paper crown…See I told you they were versatile! 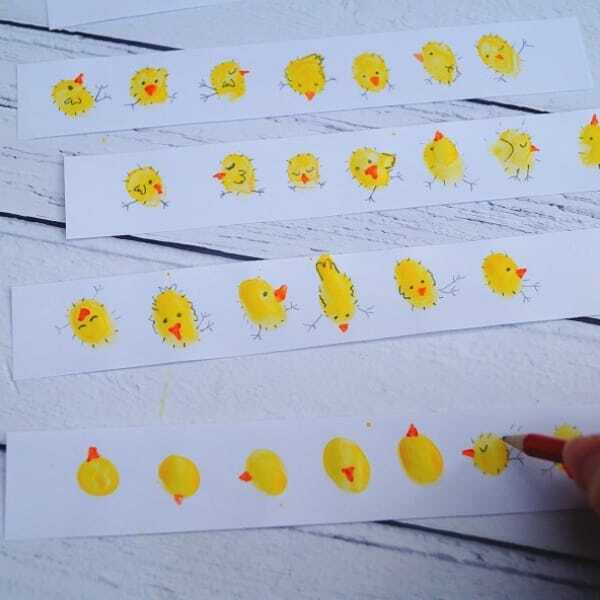 In this make we’ll be combining the simple art of finger painting to create some super cute chicks (each with their very own personality) but if you don’t have any paints handy (or don’t want any mess at all) then a yellow coloured pencil can be used instead. 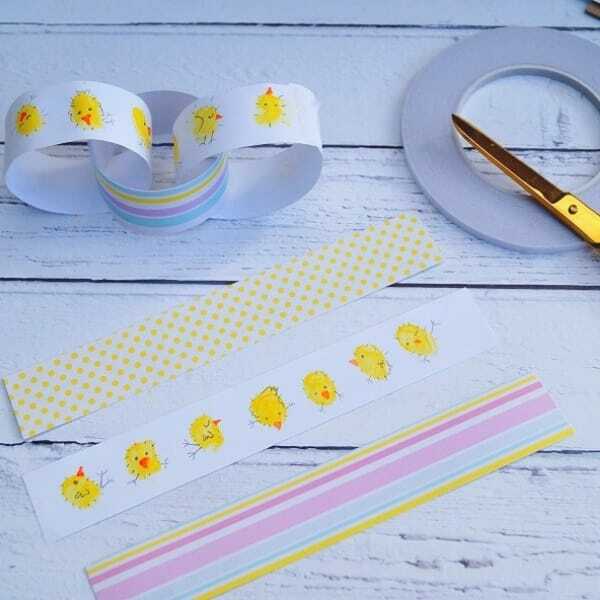 What you’ll need: A mix of plain white printer paper and patterned papers, yellow paint or a yellow pencil (we’ve used some old water colour paints), an orange pencil, a normal pencil, double sided tape, scissors (or a paper cutter). Step 1 – Cut your papers into strips of the same width and length (we’ve cut ours approx 210 x 30mm with a paper cutter ). 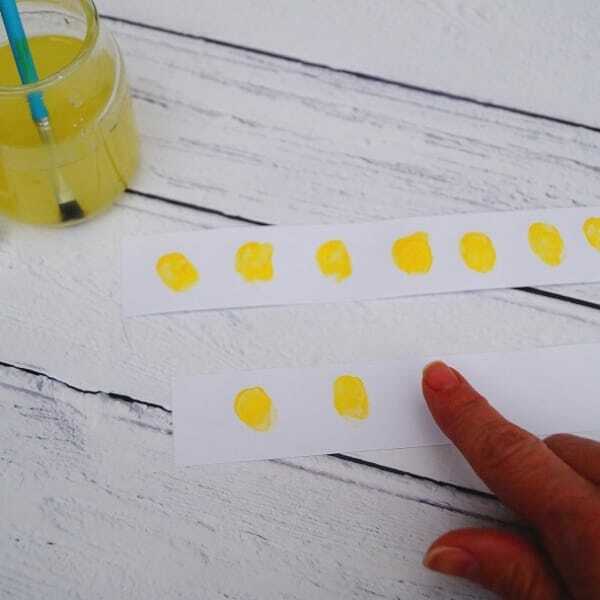 Then take the white paper strips, wet your finger, dip into the paint and dot the paper with yellow finger prints (or draw and colour yellow circles or ovals with a yellow coloured pencil). 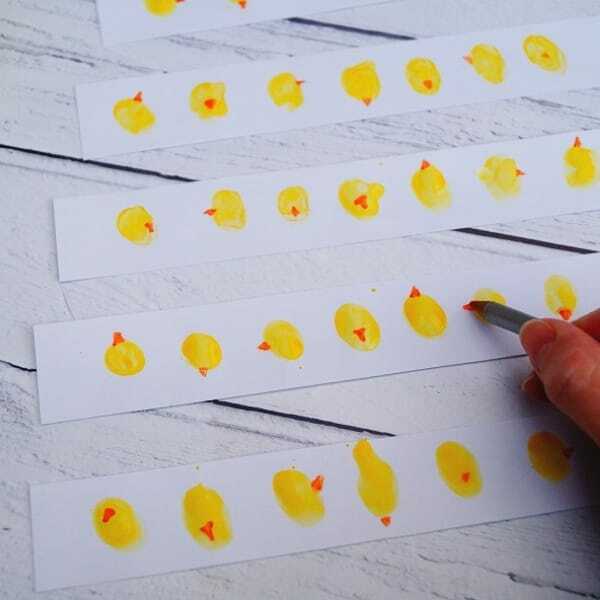 Step 2 – When the paint is dry, add triangle shapes in orange pencil to make their beaks. Step 3 – Time to pick up your pencil, give them their expressions and decide what kind of chicks they are….Dancing, jumping, flying, sleeping! 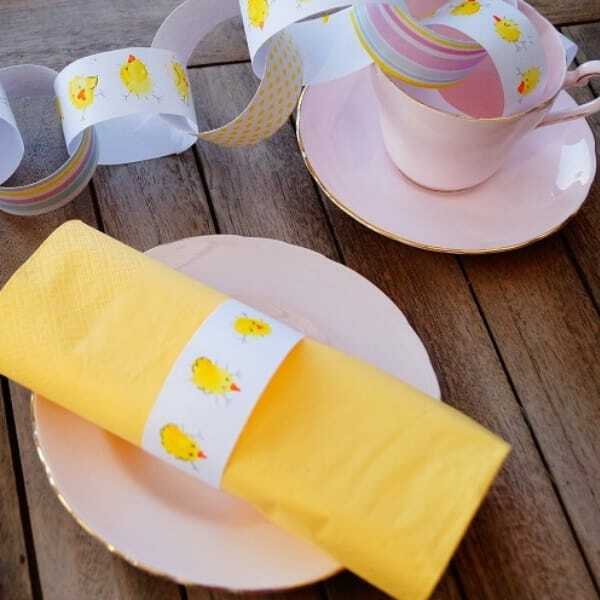 Step 4 – Take your double sided tape and stick one of the strips of chick paper together to make the first loop. Step 5 – Then taking a different patterned paper, thread that through the first, stick and repeat to make a chain the length you require. 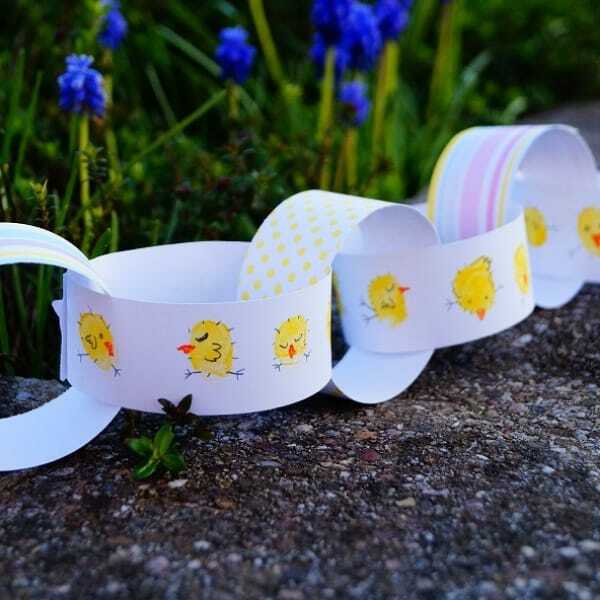 And there you have it...Your very own and very cute Easter Chick Paper Chain to brighten up your home or garden. 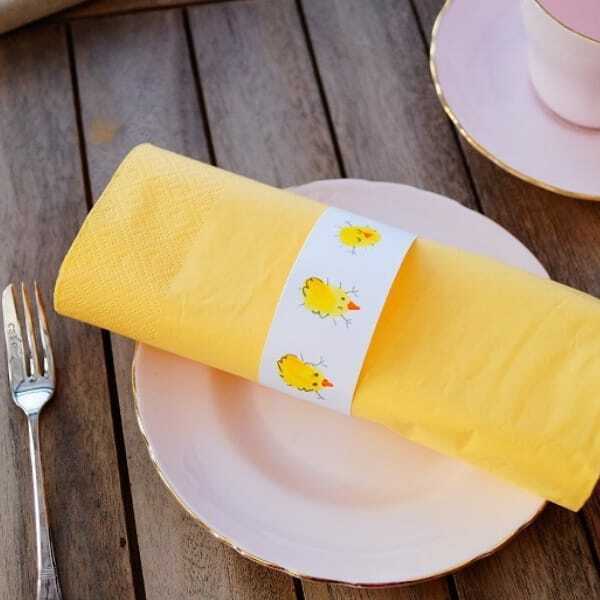 And don’t forget all the other things you can make too…Including a matching napkin ring….Well it’d be jolly rude not to! Happy making everyone.